I think; therefore, I think I am. related to the mind and myth of Ambrose Bierce. 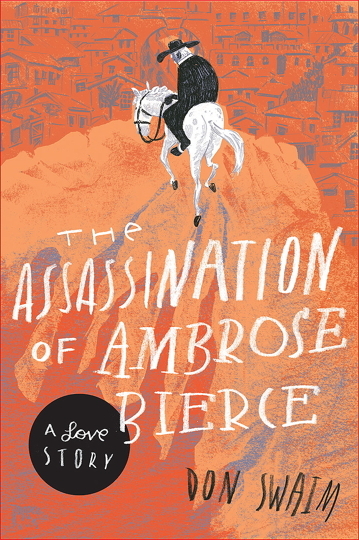 FREEFor each submission posted on the site the author will receive a FREE copy of The Assassination of Ambrose: A Love Story, Hippocampus Press, New York. Alas and alack. Social media has prevailed. Our years-old Bravenet message board, with its annoying ads, has essentially been replaced by Facebook. If you have questions or comments about Bierce, simply join our new Bierce Facebook page. It's an open group. Just click to join. Our old message board will soon vanish -- although not as mysteriously as Bierce. It'll remain up for a while if you want to read old postings -- or even post. A personal page about, yes, sunsets over Pennsylvania. Try it. Make Shakespeare Proud! 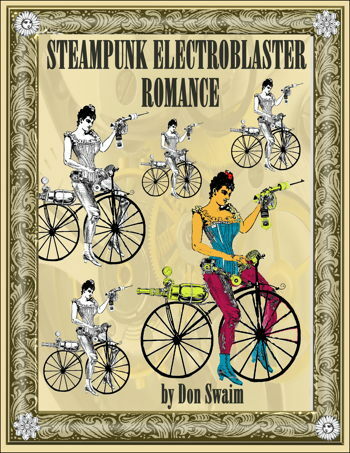 Don Swaim, founder of the Ambrose Bierce Site, won first prize for his short story, "Dearest Friend, Annie," which focuses on the relationship between Walt Whitman and Anne Gilchrist. Three others placed in the youth division. 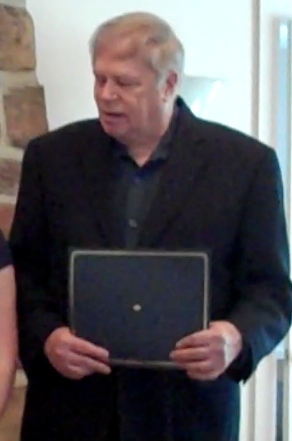 Swaim [above] is shown accepting the award under a portrait of Pearl S. Buck at the historic Buck house on April 10, 2011. Buck, author of The Good Earth, won the Nobel Prize for literature, and her Pennsylvania, home is a National Historic Landmark. 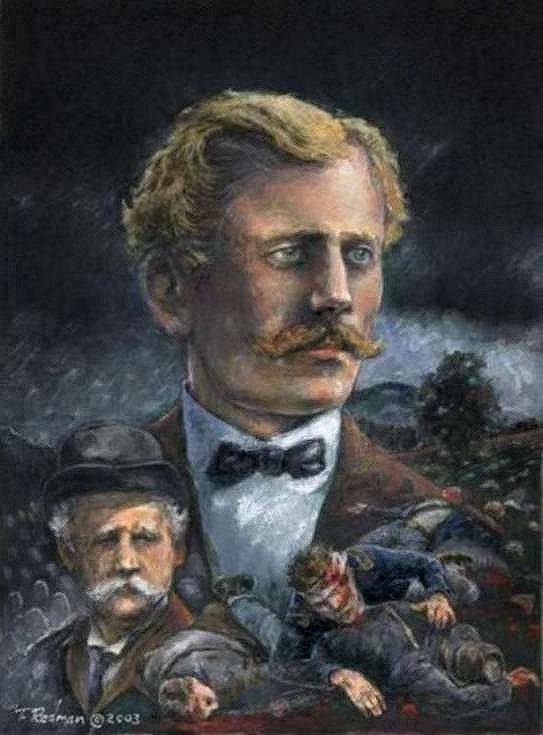 Bierce as adapted from the artist Sanjin Masic of Sarajevo and used with his permission. 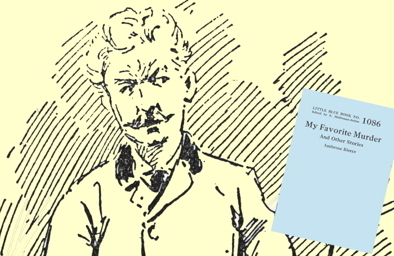 Drawing of Ambrose Bierce by David Levine used with permission. Nuggets and Dust by "Dod Grile," Ambrose Bierce's second book, was published under his pseudonym by Chatto and Windus in London in 1871, when Bierce was an expatriate. 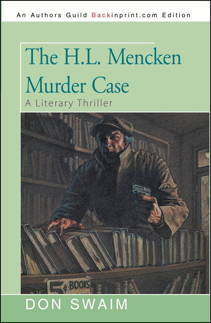 Its subtitle is "Panned Out in California," loosely arranged by "J. Milton Sloluck," another of Bierce's pseudonyms. 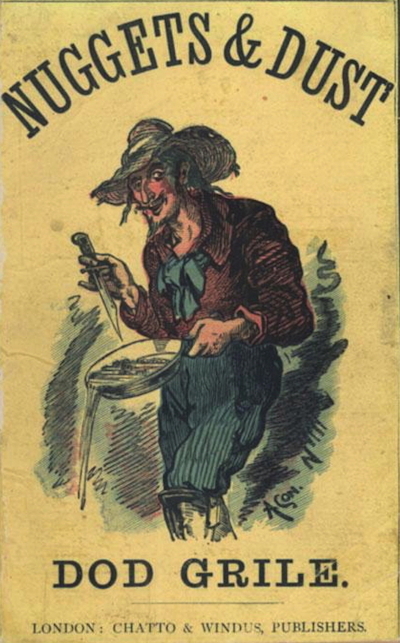 It was a cheap paperback showing on the cover a miner panning gold and holding a knife. In this first and only edition (until now) there were ads on the back cover for Crosby's Balsamic Cough Elixir and Dr. Rooke's Oriental Pills and Solar Elixir, plus several pages of ads at the front. Essentially, the book reprinted bits and pieces from Bierce's "Town Crier" columns in the San Francisco News-Letter as well as more current jottings. 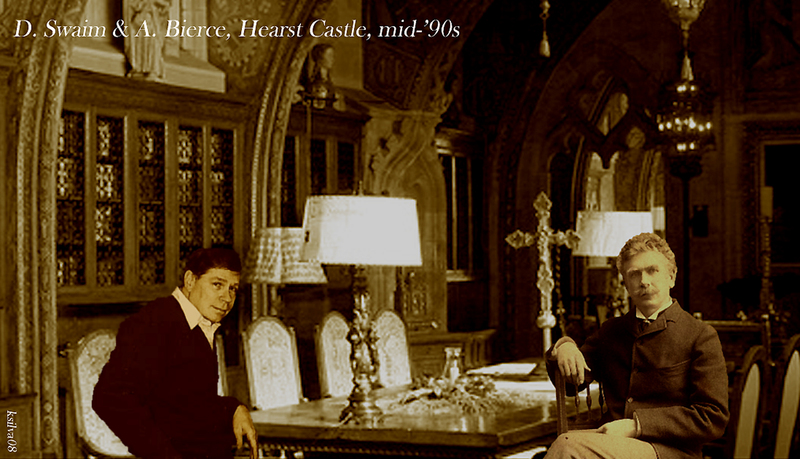 It was neither physically nor literarily a handsome product, and Bierce never republished it. The contents might be described as amusing trifles. It's now a rarity for Bierce collectors. A recent Internet search located only two copies for sale, both at high prices and in poor condition. in 2017, Didcot House, which appears to be based in the U.K., came out with a paperback edition using Amazon's Create Space. Now, a firm called Reink Books of Delhi, India, is offering a paperback edition for $15.07 with no overseas shipping fee. Strangely, the Reink edition, distributed by S N Books World, identifies the author nowhere in the book, merely a plain cover with the title and an ID number. The book is said to have been reprinted from the original edition, and appears to be a facsimile, evidence of what this rare Bierce item actually looked like when the pages were opened. 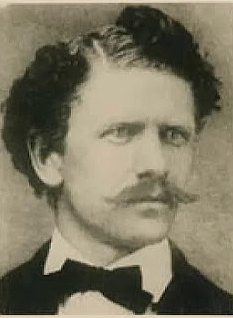 This is a photo of a youthful Bierce, probably taken during or just after his military service. Notice what appears to be a groove through the hairline. More than likely, this was the result of his being wounded in the head by a Confederate sniper during the Battle of of Kennesaw Mountain, Georgia, in 1864. It is impossible for one to look at him without a lively disgust, similar to that inspired by the spectacle of a tangled web of rattlesnakes thawing and reeking in the spring sunlight. A single individual of the species is intolerable, but put a score of them into close contact, and straightway they shall begin to enact you so varied and multifold unpleasantness -- so distracting and displeasing pranks -- a myriad of so fathomless abominations, that one would fain be a dog, if that dog only were any better or worse -- which they are not. We never look upon man without thinking of that horrid -- perhaps fabled -- animal that is clean-limbed, and sweet, and gracious, and comely, but which no sooner touches one of its kind than it begins to expire a noxious odor.... Immortal, are you, yahoo? Godlike? In the image of your Maker? And yet you thieve, you beat wives, and you die in all manner of unseemly ways! You give lectures and give birth; you have collisions, and fires, and divine service, and the small-pox. Talk not to us, monster, of your godlike attributes; we know you for a most pestilent and forbidding beast requiring the constant purification of water, and oft-renewed anointing with perfumes. 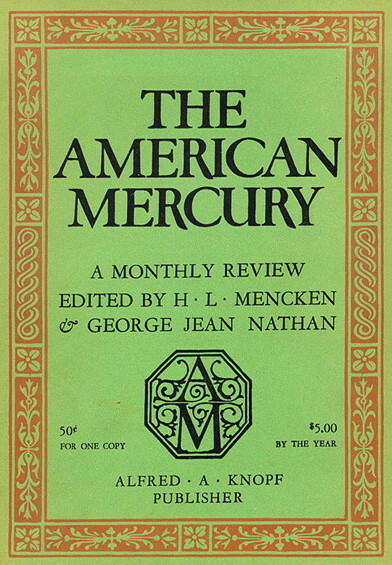 Don Swaim's article, "Ambrose & Henry," examines the relationship between Bierce and Mencken in the spring 2011 edition of Menckeniana, published by the Enoch Pratt Free Library, Baltimore. To read it go to: Menckeniana. The geography quote attributed to Ambrose Bierce has been knocking around the Internet for years. [Google shows 159,000 entries for it.] Ive never found the origin for War is Gods way of teaching Americans geography, nor has David E. Schultz, who along with S.T. 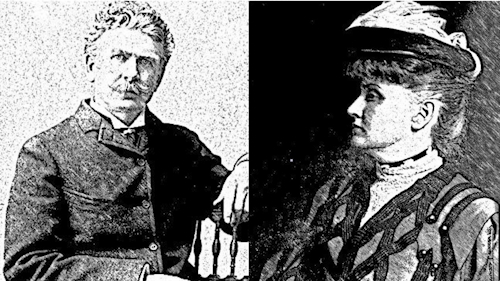 Joshi, has created a voluminous database of Bierces works. 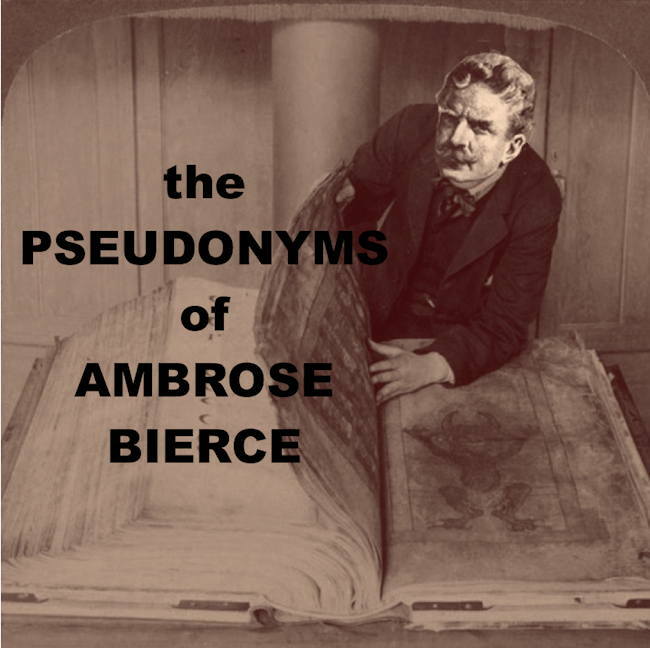 Schultz told The Ambrose Bierce Site: Ive looked high and low through my electronic archive of Bierces writings (c. 4.5 million words) and have never come across this. Ive found numerous attributions to Bierce on the Web, but believe that Paul Rodriguez [Mexican-born stand-up comedian] is probably the originator. Its one of those quotes that sounds like Bierce but isnt. Nor do I believe Bierce ever said, "The covers of this book are too far apart." If he did, I've never found the source, nor the name of the book to which he allegedly referred. The line is often repeated as though it's a given that Bierce authored that devastating put-down, but even if he didn't it's almost too good a line not to award it to him. born June 24, 1842-died ? 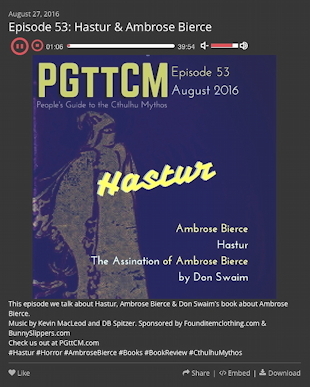 Spitzer's 40-minute podcast [People's Guide to the Cthulhu Mythos] is divided into three parts: the first focuses on "Hastur," a character who first appears in Bierce's short story "Haita the Shepherd" in 1893. The character's name was subsequently appropriated by both H.P. Lovecraft and Robert W. Chambers. 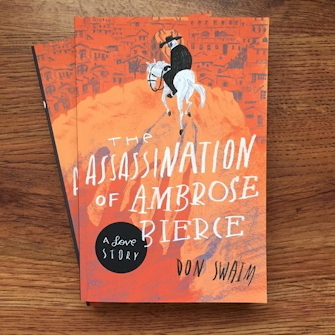 The podcast's second part is a review of Don Swaim's The Assassination of Ambrose Bierce: A Love Story. 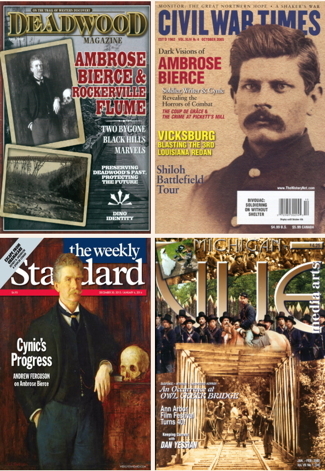 And the third a biographical essay on Bierce. A FAMOUS WRITER VANISHES INTO MEXICO NEVER TO RETURN—OR DOES HE? and Bierce said... LET THERE BE LIGHT! June 24, 1842 to  ? Once upon a time, there was a brave soldier. His specialty was going in front of the Union armies with small units and making maps and sketches of the tricky spots on the proposed route, under fire. But he is not famous for this. Then he went West, exploring, and made the first maps of the Black Hills that were useful. He taught himself to write by reading the classics at a boring job at the San Francisco Mint, and broke into newspaper work. 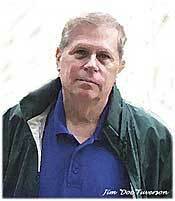 He became the top columnist in San Francisco in a time when the writer stood behind his work with a gun, not a lawyer. He married rich, went to England, learned a lot from the writers there, and taught some tricks himself. But this is just a footnote. He wrote the first Civil War fiction that included the terror and put the glory in its place. It was so good that a whole generation of professional officers became abject fans. And every time the press fomented a war fever, he wrote on military subjects with a stark clarity that never forgot that the final result would be flowing blood and shattered bone. But this is poorly remembered. He wrote fine poetry, often to a deadline, and trained a generation of poets -- became a sort of literary cult leader. But this is a matter for English professors. And he was funny politically, too, always opposed to demagogy and privilege alike, showing no faith that the common man could command politics, or the rich man transcend his greed. Split the difference between George Orwell and Herbert Spencer and you might approach the ideas of this writer who reached millions through the Hearst press. But this interests very few. 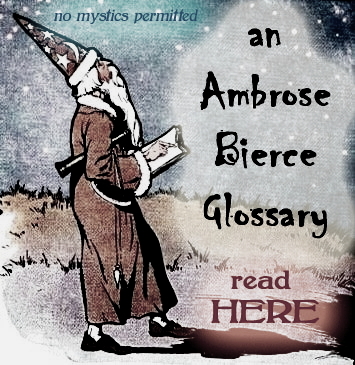 Thus, Ambrose Bierce is best remembered today because nobody knows what happened to him. He went into the whirlpool of the Mexican Revolution in December 1913, and never popped up. He was good at writing spooky stories, and four or five have been hitched to his star. 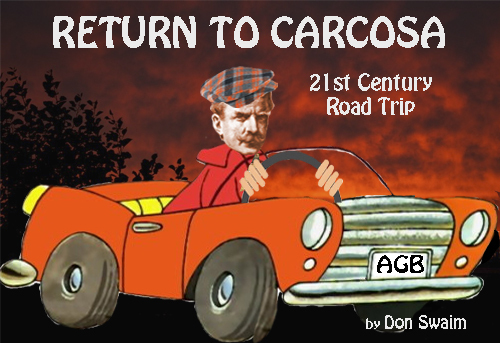 This amateur historian sought to locate Bierce's remains in the Mexican desert -- and published his findings on The Ambrose Bierce Site. Unfortunately, he came up short. 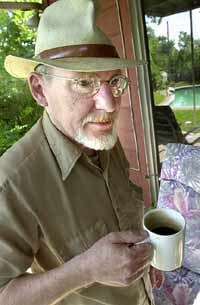 The colorful, eccentric Day -- whose coffee cup was often filled with more than coffee -- died in 2011 without proving his theory. The Oxoxoco Bottle Author Gerald Kersh came up with a yarn in the 1950s about Bierce being fattened up by cannibals in Mexico. 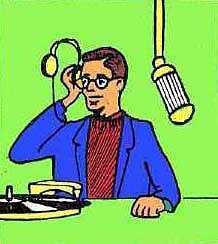 It appeared in Kersh's story collection Men Without Bones and was republished in The Saturday Evening Post. 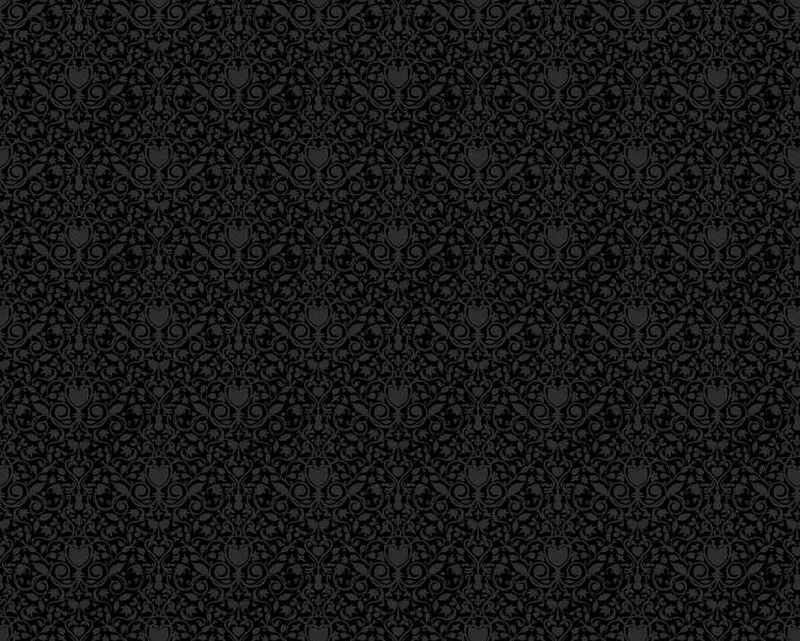 Details HERE [scroll down] . Superstitious ignorance and mysticism? Bierce nails it. 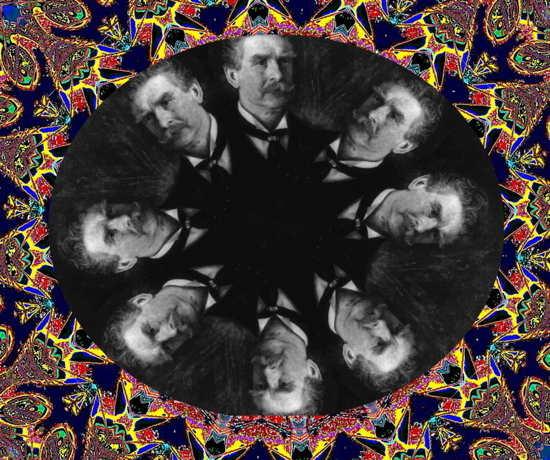 on Ambrose Bierce -- and the weird tale. Drawing of Ambrose Bierce © Matthew & Eve Levine 2012. Limited edition prints and licensing opportunities available through D. Levine Ink. Don Swaim's definitive article, "Ambrose & Henry," is in the spring 2011 edition of the online scholarly publication Menckeniana, all about H.L. Mencken, published by the Enoch Pratt Free Library, Baltimore. To read the actual issue go to: Menckeniana. Courtesy Enoch Pratt Free Library, Baltimore.